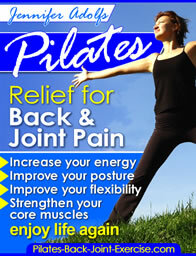 I find Pilates to be a very challenging and most effective abdominal exercise for women of all ages and abilities. I love Pilates and so do many of my female students. I have students aging from 17 to 87 years old, well, and my toddler Kate who loves the fun rolling movements. There are exercises within the Pilates series to suit everyone no matter how strong or feeble you are. The Pilates exercise video below is specifically for women who want to learn how to engage the pelvic floor muscles and work the deeper muscles of the abdomen for a flatter stomach, less back and pelvic pain, and strong intra-abdominal muscles that help women control their deep muscles of the pelvis. 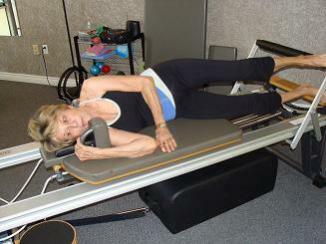 The Pilates Teaser is one of the most advanced and challenging of the Pilates abdominal exercises. The classic mat exercises can be very difficult to do on the floor, that's why utilizing the spring tension on the equipment can make these exercises easier or harder depending on how you adjust them. I am demonstrating the full advanced teaser pose here, but you may find more options and modifications to doing it from my exercise of the month page here. One of my favorite ways to do Pilates exercises is on the Core or Abdominal Workout Ball. This is one of the most challenging ways to do abdominal exercises as you have the added instability of trying to control the movement of the ball while performing your Pilates movements. I am performing the jacknife on the ab Pilates ball here. I love the feeling of rolling with the ball while getting a deep core abdominal workout. Check out my favorite abdominal workout with the Pilate Core Ball here! Side lying abdominal exercises should not be skipped as they target the side obliques, which helps to give you a longer leaner waist. The women on the left here is in her 70's and has been doing ab Pilates exercises for over 7 years. Her health has never been better and she does not look a day over 60! See more of my Pilates equipment workouts from here. Even when you are pregnant you want to do abdominal exercises. It is a bit more challenging to find the right ones, and those that are safe. I used the exercise ball during the latter half of my pregnancy to keep myself flexible and my core abdominals strong without hurting the baby. Check out more ways you can use Pilates for your core, back, hips, and shoulders here.